Rising sun mark blue & white tea-set Japan:- This old tea set was left to me by my late mother she had in turn inherited it from my grandmother and grandfather who died in the mid seventies. My grandfather was involved in both WW1 and WW2 and in civilian life he was a paper importer in Hamburg then West Germany. He was lets say pretty well off, and I remember as a child going on holiday to his country house in Holm-seppensen near Bucholtz where he owned a couple of square acres of the Black Forest. I well remember the tranquility of the Black Forrest at night, I also remember the little red ants which gave you a nasty bite. A little benefit that came from my Father being a British soldier in Germany was that when he and My mother married in a British Forces camp, the German Government was in the process of change from the Nazi regime to (I believe the German Democratic Republic or GDR)there was a period of 2 days when no government was in place in Germany so the marriage was never recognised by Germany. This leaves me in the unenviable, enviable position of having a full British Passport in my Fathers name (Hunter), and being illegitimate in Germany but holding a full German Passport in my Mothers name (Jacobsen) this is handy when booking holidays on line as I can book single flights both ways always cheaper and I can take my duty free both ways. Well, a lovely Japanese set - I especially like the woven handle of the teapot and the bold blue and white pattern. The mark is not recognizable for me as it isn't shown in any of the books I have. I have no knowledge at all of Japanese markings, but even people who have studied this area are often bamboozled. translation is something like "Japan Special Made" or "Nippon Tokusei". The characters underneath the sun on your mark are not shown exactly the same, but it appears the wares are from the same stable, which even Gotheborg is unsure of the origin of. He says the wares often have a 'glassy' look and feel to them - something I can't tell from your photos. 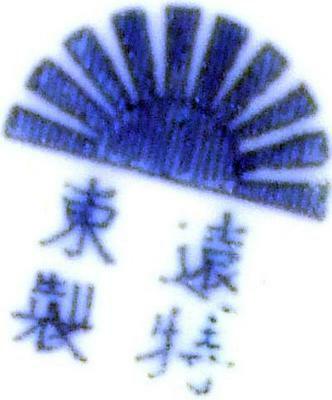 At any rate, he is suggesting the wares with the rising sun mark as shown on his site are from the mid part of the 20th century, either immediately before or after the war. I don't know how this fits in with your timeline. As with many Japanese wares, the markings are not particularly designed to identify the kiln in which the items were produced. There are many obstacles getting in the way of the intrepid Westerner trying to gain insights into exact origin and meaning of a pottery mark. The first is the Japanese writing. There are many different methods of writing the same thing, and many characters and words have dual meanings. The Japanese culture didn't develop a writing method, so appropriated the Chinese style of writing which over the centuries, diversified into various Japanese writing and reading methods. 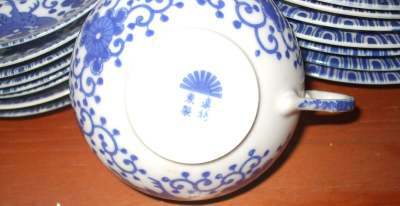 The second problem is that, even when the writing on the bottom of a ceramic item is accurately interpreted (no mean feat even for a native of Japan), the resulting translation often gives no clue as to the origin - for example, all your fancy characters may end up saying is "Japan Special Made". This may not be the case (who can tell us? ), but it would be typical in my experience, such is the obscuration of Japanese markings. Your story is both well written and fascinating, and I very much enjoyed reading it. I wish more people had this skill of painting a picture of their items as it really lifts this website above all others online. If you notice, one of the fascinations of the Antiques Roadshow, both on the BBC (UK) and PBS (US) is how the items came into the hands of the people involved. Same here.